The road I take to town each day is one of my favorites to travel in the fall. It runs straight through our local nature center and the trees on each side are simply breathtaking. The leaves radiate autumnal hues of gold, amber and crimson. Just before the nature center is a serene horse track and training area. Watching the horses ride through the green fields with nothing but fall foliage as their backdrop is truly an indescribable sight. Whether it’s the chocolate brown leather saddle and bridle, or the contrast between grass, trees and sky, the images I’ve taken from that long stretch of road automatically connect classic equestrian style with the fall in my mind. 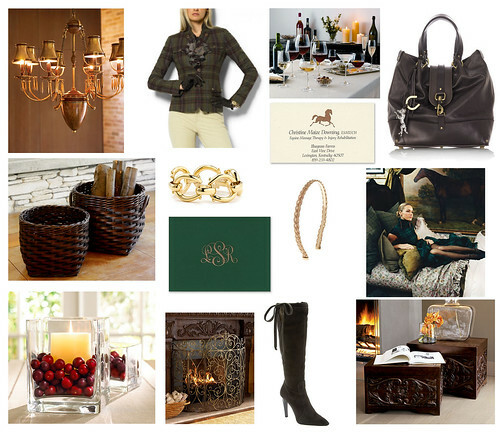 Moved by the rich colors of autumn and those majestic thoroughbreds, I’ve created the following inspiration board.